The exhibitions and images pictured are from 2012-2016. In 2017, Jan Brandt Gallery moved to a new location at 1305 Morrissey Drive, Bloomington, IL. Images of the new space are listed under "The Guest Room"
Ivonne's sensitive colored pencil portraits of American citizens may lead the viewer to pause and reflect upon the meaning and mantle of American citizenship among and between the different generations of immigrants to our country. ifelong Illinois resident Ann E. Coulter lives in rural Elmwood and maintains a studio in Peoria’s Warehouse District. Her paintings seek to discover and define the subtle, often overlooked beauty of the local Midwestern landscape. In this new series, “The Homely Creek”, Coulter turns to familiar, farmland waterways, some as close as her own back yard, offering views through underbrush and overgrowth, informed by the distinctive dim of a rainy day. These introspective images invite careful observation, holding the viewer in a place where time slows and thoughts are allowed to wander. The unassuming, mid-western landscape provides the focus for Ann Coulter’s drawings and paintings. Inspired by the wide open spaces that define this part of the country, the artist captures moments that describe a sense of light, season, weather and atmosphere. Living near Elmwood, Illinois, in the midst of farm fields and enormous skies, Coulter has intentionally centered herself within her subject, relying on the ever changing experience that surrounds her as an endless source for her paintings and drawings. Investigating relationships of place and time is a significant theme in her work. The notion that the landscape can hold a sense of its own history; a deep, cyclical timelessness, even as it is changing moment by moment, is a source of continual fascination for the artist. Coulter’s paintings offer an invitation to contemplate the world around us, and to connect with the ongoing pulse of nature. Ann E. Coulter is a life-long resident of Illinois. She holds degrees in studio art from Illinois State University, San Diego State University and Bradley University, and has taught drawing for Bradley University in Peoria, Illinois. She is currently a full-time artist with a studio in Peoria’s historic Warehouse District. She is represented by Argazzi Art in Lakeville, Connecticut. More of her work can be seen at AnnECoulterArtist.com. Growing up in suburban Long Island, surrounded by, immersed in and photographing the middle class American dream, I never thought much about the popular culture I was documenting. Like the title character in the movie Pecker, I photographed my surroundings, loving the magic of making images, but never understanding them in any way other than how they looked. When I started to get involved with Community Darkroom/Light Work and began meeting the monthly Artists in Residence, I began to understand the importance of meaning in photography. Eventually, my street portraits evolved into photographing the facades we attempt to project and later I photographed shopping mall culture. In the early 1990’s I came out to Illinois to attend Graduate School and be a part of the Rural Documentary Program at Illinois State University. It quickly became obvious that I had little understanding of or appreciation for either the rural or farm lifestyle and culture. I went back to photographing in malls, a culture I understood. Every once in a blue moon, I would stumble across a simulation of a flag, rather than the flag itself. I was not accustomed to them or the atmosphere in which they resided. At the time, they were very few and far between. They seemed to sit at an intersection of patriotism, popular culture, commerce and religion. I began to examine and photograph it. After 9/11, flags, simulations of flags and photographs of the American Flag became so commonplace I stopped photographing them. There seemed to be largely a strongly felt yet fleeting thought behind them and the images of them. Sadly, many of the simulations of the flag have now greatly deteriorated. Within the last few years, I have started photographing them again. Some are just remnants of 9/11. In some simulations, the meaning is strictly commercial or political. For most people that create them they hold great meaning. They love them as much as the people who believe the flag should only exist as a flag. For them, the weathering only adds to the meaning. Everyone will assign their own meaning to these images. Cautious Exuberance embraces the paradox presented by the intersection of a traditional domestic landscape and artistic productivity. The work reflects the sacrifices, challenges, freedom, and uninhibited joy of parenthood. Fragility interplays with strength. Reverence replaces frivolity. The materials, forms, and modes of productions are infused with memory and sentimentality and exist in a state of premature nostalgia. Amid tantrums and diapers, an authentic presence in each moment is difficult to maintain. There is profundity in the banal, but it is also spectacularly boring. Cautious Exuberance strives to capture this contradiction. Erin Elizabeth is a conceptual artist and utilizes non-traditional materials such as cake and sprinkles along with über traditional and loaded symbols such as gold leaf in order to explore questions about banality, celebration, and experiential value. Harry Sidebotham is first and foremost a painter. He engages in the tradition of painting, investigating scientific theories such as parallel dimension theory. Both received a B.F.A. from The School of The Art Institute of Chicago in 2009 and a M.F.A. from Illinois State University in 2014. They have two young children and use similar systematic strategies of repetition and sacred geometry, resulting in visually compatible bodies of work. Call it a daydream, an act or a fantasy; the tricks our mind play on our memories is a wonderful delirium that should be embraced as the most romantic of all utopian ideologies. Each false world that we create brings legitimacy to the one we wake up in every day. It’s not our job as artists to discover something that has never been said before. The goal is to connect with humanity and show them a different way of looking at an already familiar concept. There is a language to finding it, a mythology that acts as a moral compass. Though there are many directions to go, you recognize “beauty” wherever it leads you. With these paintings, I hope to activate the mind of the viewer in a different way, allowing space for their interpretation of the work to come from their own thoughts, feelings, and memories. The compositions playfully reference the pseudo-inspirational posters found in junior high schools across the country, as well as the banal, “uplifting” memes probably populating your Facebook Newsfeed, but with a darker, cynical twist. The floral backgrounds always come from a place of deep introspection and here, I rely on formal elements, specifically color and line quality, to communicate a more generalized mode of feeling. The text is then painstakingly painted on top until opaque. The words themselves come from intensely personal experiences, but are phrased in an open ended and flexible manner, ultimately exploiting the supposed universality of the human condition to simulate honest connection and understanding. It is upon reading the text that the viewer is immediately invited to search for relevance in their own life, projecting their own experiences onto the work, and perhaps unearthing meaning entirely of their own within the painting. In this way, the work is never complete without viewer participation. There is no right answer and there is no wrong answer. There is only my mind and your mind and the hope that a painting can serve as a vehicle for connection. Danny Epstein received his Bachelor of Arts in Studio Art from the University of Denver, graduating in 2015. He was born and raised in Chicago, Illinois and currently lives and works there. Epstein identifies as a painter, but cites the heavy influence of both the Conceptual/Post Conceptual and Light and Space movements in the creation of his artwork. His work was most recently exhibited at a Minneapolis artist-run gallery, Yeah Maybe. Forty works by ISU alumni to celebrate and honor the 40th anniversary of Normal Editions Workshop. A Group Printmaking Exhibition featuring Illinois State University past and current faculty, staff, and current and future graduate students. Gardeners know that if mint is planted it will grow like wildfire. The group of artists invited to participate in "When you plant mint..." represent the printmaking legacy of Illinois State University: of the past, of the present, and of the future. Our faculty, staff, and alumni are respected, and known throughout the printmaking community for being a beacon of education, innovation, and promise. With the 40th anniversary of Normal Editions Workshop, there is no better time to celebrate. A celebration of a printmaking program built upon a commitment to artistic growth and education above all else. Thus, Illinois State University printmakers grow like mint because our foundation was carefully tilled, weeds constantly picked, and plants always nourished. As a current graduate student, it is my honor and privilege to represent Illinois State University as the curator of "When you plant mint...", and I hope to carry the technical proficiency, intellectual gumption, and artistic self-awareness as an Illinois State printmaker to future adventures. Randy Reid was born in Madison, Wisconsin in 1965. In 1996 he earned his MFA at Illinois State University. He is an Assistant Professor of Art and runs the Wood and Metals programs at Illinois State University’s School of Art. Reid predominantly works in the medium of wood and small metals, but utilizes bronze foundry work in many of his commissioned pieces. Reid is a master craftsman, designer and artist who creates contemporary sculpture by using traditional woodworking and metals techniques, which have been utilized for centuries in the creation of functional vessels and furniture. He has taken both furniture and the vessel form to the level of high art where function dissolves and aesthetics demand the viewer’s attention. He consistently creates elegant forms in his distinctive style, blurring the line between craft and fine art. 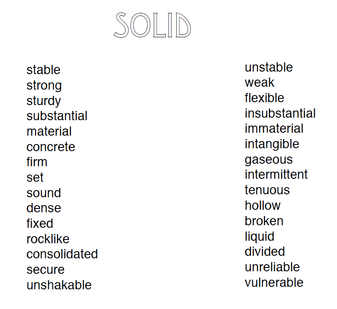 These lists open ideas embedded within a viewer’s understanding of the word solid (psychological, cultural, or otherwise), which may be considered in relation to the paintings. In the work, disparate elements separate or merge space and shape across illusionistic depth. Through fragmentation, pattern, and different paint applications that evoke varying states of matter, I undermine the notion of solidity that the title suggests. On which criteria and to what extent do we recognize a thing, belief, or idea as solid, and how does our relationship to ideas of solidity affect the way we live our lives? Megan Kathol Bersett received her MFA from Illinois State University in 2013, and her BFA from Truman State University in 2001. She has exhibited her work at the Center for Contemporary Art in Santa Fe, New Mexico; Hand Artes Gallery in Truchas, New Mexico; The University of Massachusetts in Amherst; La Casa Cultural in San Jose (Escazu), Costa Rica; Drake University in Des Moines, Iowa; and McHenry County College in Crystal Lake, Illinois. She was featured on Studiobreak.com, a contemporary art podcast, and participated in Lori Waxman’s recent 60wrd/min art critic performance critique at Illinois State’s University Galleries in Normal, Illinois. The artist currently lives and works in Bloomington, Illinois. Flat/Not Flat presents my recent work; exploring notions of spatial illusion, color phenomenology, the communicative power of repeated forms, and the lure of beauty. "New Beauty" is a collection of portraits of Drag Performers by photographer Britten Traughber. These photographs are a celebration of color and persona, showcasing the eclectic beauty of artists in the Drag communities of Hawaii and Illinois. Artists include: Bec+Col Stafford, Jiwon Choi, Wednesday Kim, Tara Jaggers, Jillian Mayer, RPGZ (Ryan Paluczak and Greg Sullo), and Alice Zilberber. A collection of work created by students in the Advanced Art Program at Bloomington High School, Bloomington, IL, led by teacher Monica Estabrook. Jeff is a Bloomington, IL artist and graphic designer. His paintings in FLOAT question our sense of place by disrupting the force of gravity. The skillfully painted images are at both humorous and thought-provoking. (Re) Vision - What is Post-Black? Curated by Illinois State University MFA and Women's & Gender Studies Certificate Candidate Venise Keys. (Re)Vision seeks to contribute to the conversation about post-black art by (1) showcasing emerging African American artists exploring affirming possibilities of black identity; in the artwork and upon themselves as producers (2) bring awareness to African American art history by examining the efforts of black artist collectives and movements (3) discussing privilege, power, and access knowledge for artists of color in the academy. In this installation, artist Janett Pulido Zizumbo combined elements of painterly marks and found material to bring forth current issues occurring in Mexico. Specifically, in reference to an incident that has occurred September 26, 2014, in which 43 college students on route to a protest have disappeared in Iguala, Guerrero, Mexico. This particular project contained 43 art pieces in homage to reflect each disappeared college student and include some form of individuality to each piece to reference them and current issues in Mexico. This project not only refers to this particular incident but also the desensitization from the people being oppressed from the government and other entities. She believes that her family’s home is in constant limbo, not knowing how the current standing of social politics will lead the future state of Mexico, which exudes anxiety in a possible retaliation against her family that resides in the same country. Biography: Janett Pulido Zizumbo is a Mexican-American fine artist whose artwork revolves around the notion of perception and how visual perception skews the mind of the viewer. She explores religious and social concepts that play a part in the perception of the in between. She uses concepts like purgatory in her everyday life, where she feels in constant limbo and grinds to make decisions at every moment. She often employs unconventional materials when painting, that range from plaster, resin, wire, paper to styrofoam and wood. Her practice has been described as an “exploration of physicality” in her experimentations with different textures and planes that often re-evaluate and expand the limits and boundaries of painting. Janett Pulido has received numerous awards and grants. She has recently received an artist residency fellowship in Venice, Italy, Las Damas Fellowship and the Josephina Ferran Scholarship for Latina women artists and has received several travel grants for her research in Islamic theology and Art in Istanbul, Turkey. Janett Pulido was born in Chicago, IL. She received her BFA and BS at Illinois State University and received her MFA at the University of South Florida. She is currently teaching and living in Mexico City. My Father’s Knee (2014) Before I stood on his shoulders, I sat on his knee. My Father’s Knee is a cinematic essay about my relationship to my Father, Jesus Mario Contreras Sr. He worked as a manual laborer for a majority of his life, with the dream that my sisters and I wouldn’t have to. His belief that education and opportunity is the key to a fulfilled life is what’s kept immigrants coming to the United States for generations but sons and daughters of new American families don’t always play their part. The goal of My Fatherʼs Knee is to renew the viewerʼs appreciation of citizenship and education by demonstrating that the American Dream is alive and well. I also invite the viewer to analyze whose shoulders they stand on by taking on the role of someone that took citizenship and education for granted. I hope that this approach will foster a dialogue about what it means to be American and whether our immigration policy reflects our values by showing true citizenry by those denied the rights of citizenship. This project was selected for the inaugural class of Diverse Voices in Docs, a professional development and mentorship program for emerging documentary filmmakers of color, organized by Kartemquin Films and the Community Film Workshop of Chicago. We are exploring the possibilities of creating artworks that are ephemeral and use some nontraditional materials such as seeds and kombucha scobys. Kombucha is a fermented tea made using a symbiotic culture of bacteria and yeast called a scoby. The acidity of the kombucha infused scobys allows them to etch zinc plates in 5-7 days. The structure of some of the first works are inspired by the familiar and tactile nature of books and paper. As we moved from the rectangle of the common book we added the flow of forms from nature, leaves falling, grasses swaying, and seeds blowing in the wind. As these explorations develop, our intent is for many of the works to have a life beyond the walls of the gallery. Lisa Lofgren is a printmaking enthusiast and founder of a community printmaking and papermaking facility titled cometogether print&paper in coordination with cometogetherstudios in Bloomington, Illinois. She is the owner of Main Gallery 404 in Downtown Bloomington and an adjunct faculty member in art at Eureka College in Eureka, Illinois. Lisa received her BFA at the University of Wyoming in 2008 and her MFA at Illinois State University in 2012 for printmaking. She looks forward to her solo exhibit of works on paper at the Joe McCauley Gallery at Heartland Community College in March of 2016. She learned the art of papermaking through classes and workshops at ISU; in Kerala, India and at the Minnesota Center for Book Art in Minneapolis. Melanie Scott-Dockery completed a MFA at Northern Illinois University in 2004 and a BA in fine art at the University of Southern Indiana in 1997. During the summer of 1995 she studied art in Florence, Italy through Indiana University’s overseas program. Since the early 1990s, she has exhibited her work throughout the Midwest of the United States. International exhibits include Liste 09 in Basel, Switzerland and Kunstraum Kreuzberg/Bethanien in Berlin, Germany with Anonymous Drawings. Her solo exhibit Bacteria, Fungus, Plant in 2014 included paper grown from bacteria and fungus, pollen as a drawing medium, and a four foot canvas that was planted and harvested for transformation into a new work of art for Sense of Place at Jan Brandt Gallery. Mel Cook | Things Will Be Fine. Mel Cook’s paintings address cliches and conventions of painting, the act of looking or seeing, and their relationship to feminized bodies. Her work is interested in the sexism that has pervaded the creation of images stemming from the history of painting to advertising and most recently social media platforms like Instagram. Her paintings embody and reframe roles of femininity through uses of bright colors and objects that possess a feminized history and are paired with warped private spaces where figures are often seen immersed in meditation. Her paintings are saturated with dark tones which sour the saccharine imagery. Cook’s subjective meditations on femininity and voyeurism are echoed in her process of painterly collage, which articulates the historical connection between painting and the objectification of feminized bodies. Eating more, watching more, clicking more, and moving less. The premise for my work might be a lie I am trying to convince myself, or a series of leaps that are all too far to jump. Asking myself what is fake, and what is real, and how can I be even more truthful within a lie. Falseness as the beginning of a new kind of sincerity. I aim to use beauty as a place for comedy and a space to corrupt. Laughing about a wound seems to be more productive. Sickly warm and inviting. Erin Hayden is a multi-media artist working in Chicago, Illinois. She received her Bachelor of Fine Arts in Painting and a Bachelor of Science in Art Education from Illinois State University. She is currently pursuing her Master of Fine Arts in Art Theory and Practice at Northwestern University. Her work has been exhibited at venues across the midwest, as well as New York. She has been featured in such publications as Studio Magazine, Whiskey City Collaborative, Artscog, Maudlin House, and Mutantspace. She has also been featured on Studio Break, a contemporary art podcast. Jan Brandt Gallery will be celebrating its Third Anniversary in July of 2015. The juried exhibit Sense of Place will open on July 25 in conjunction with this celebration. The theme “Sense of Place” may be openly interpreted through a lens of meaningful personal work that is grounded in direct experience, observation, and reflection. A wide range of visual opportunities such as painting, printmaking, drawing, photography, performance, video, mapping, collecting, assemblage, and sculpture are options to use within the theme. My intention for the exhibit is that it will offer viewers a chance to investigate and appreciate a variety of styles from representational to conceptual. The juror for this exhibit will be Bill Conger. Bill Conger is an artist whose works fuse playful, minimal titles with found objects. In his words, “ the resulting cadre of sculpture and imagery carries on a longstanding tradition of maudlin rumination which has propelled the creative act for millennia." His work has been exhibited extensively in the US as well as Austria, Germany, Poland, Ireland, and New Zealand. His most recent one-person exhibition was at 65GRAND in Chicago in 2014. He quietly lives and works in Peoria. "Ken Chiu at Jan Brandt Gallery", an exhibit of the photography of a great friend who always manages to capture the magic of the opening receptions. A book " Jan Brandt Gallery 2012-2015" will be available for purchase containing Ken's photographs over the three years, edited by Reid Sancken. Ladies Night Out to Benefit St. Jude. There are often clear lines drawn between nostalgia, memory, and trauma. I would argue that those lines are about as clear as mud and the reality of these emotional states are rarely independent of one another. Jan Brandt’s exhibition Five Acres is also a testament to the murk of the coming of age archetype and realizing the necessity of this complex relationship between painful memories, growing up, and remembering the past. The title of the exhibition reminded me of Maurice Kains’ 1973 book on small farm management and self-sustainability. Not only does the title fit in terms of the work in this exhibition being largely about Brandt’s time on a small acreage in Illinois but it also addresses the ability of visual art to reference, symbolize, and mean something about the past. Brandt is working—metaphorically and literally, with the materials at hand—at piecing together an important part of her development of self-hood. Images and objects like Brandt’s work in the exhibition can, in some senses, become vehicles for nostalgia, memory, and trauma. I am not talking about catharsis—in which the images or objects actually help, relieve, or cure the maker—but rather sewn together pieces of paper that carry some meaning (in the way that they are assembled, the act of sewing, the offhandedness) of an ineffable state of being. We may find moments or durations of time in our lives that are particularly troubling but the feelings and emotions are not fixed and are not separated from memories and nostalgia. Brandt’s work seems to come from this place for me—a difficult, pivotal, and formative point in her life that I can relate to my own experiences of growing up. The small farm, as a pastoral scene, is romanticized in our society, as is being independent or having independence; self-sustainability in my experience relies on communitarian principles (primarily that individuality is related to community relationships). Without others, individuality cannot be developed and has no context. This is part of the strength of Brandt’s use of collage and the act of placing multiple different pieces together to form one totality. Making art in a studio, too, can be a lonely task, and one that seems to be done independently of others until there is a public exhibition. The exhibition of works, then, provides the artist some sense of community. Brandt’s work undoubtedly deals with intensely personal memories in rural isolation, and yet they are now a part of a community in which we, as viewers, can contemplate and comprehend. Sarah Sciba finds inspiration in thrift and antique stores. “I am particularly drawn to printed handkerchiefs, tarnished costume jewelry, and decorative tchotchkes from the early part of the 20th century,” says Sciba. The wear and tear on these objects reveals their history and experiences which Sciba retells in her artwork. As a printmaker, Sciba is drawn to the relationship between mass-produced items and their handmade counterparts. Growing materials in the garden or in a culture like kombucha or sourdough connects Melanie Scott-Dockery's art to gardeners and cooks. She says, “the wait for the materials to be ready for harvest is an important part of the process. Those moments help me reflect upon our fast-paced world, the good and bad of it.” The cycle of seasons is reflected in her intention to plant some of the drawings and paintings into the garden after this gallery exhibition so the resulting plants can be harvested for new artworks or food. My most recent work draws inspiration from several sources, one being an exhibition called Garden and Cosmos: The Royal Paintings of Jodhpur. This amazing exhibition includes paintings from the 17th, 18th and 19th centuries. I fell in love with the artists’ use of patterning and minute detail. My work also draws inspiration from biological forms, and plant life. It is a formal exploration of shape and pattern. I am fascinated by nature and biology. Cells are of particular interest to me. Im intrigued by their ability to reproduce, mutate and spread uncontrollably. To the untrained eye, cells can be seen as beautiful forms/shapes, interesting patterns. However, to a specialist these forms mean so much more including the spread of unwanted disease and death. I find it fascinating how something so detrimental as cancer, can look so beautiful under a microscope. In our world, things often appear one way, but upon closer examination, are completely different. My interest in prolific growth extends to my gardening practice. Vines are a true love. These plants tend to have a life of their own, given the space, they will fill it, over take it, wrap around, creep and crawl up whatever gets in their path. Seeds and flowers are fascinating due to their repetition; a sunflower head is a wonderful example. Invasive weeds such as kudzu are mesmerizing and inspire my working process. They have the appearance of being lush and beautiful yet they are suffocating all of the other plants in their paths. Imagine a land teaming with absolute abundance. Sugary sick sticky amber drizzled over a mound of white. A thousand blurs bouncing. Light flickering from left, right, and again. Steady rhythm hum. Cry out in the hope of transformation. Rebirth and renewal. The workers toil away with a promise of tomorrow. If I’m only more obedient, fold just one more, prayers to be answered. Tonight let’s dine on curdled wax, a byproduct of our labor. Take 559 workers and fly 55,000 miles. With our faces bright, rubbed clean from years of wear, we swim. The light reveals the broken backs straining up to bless the future. I will take the chance, the great bird rising. Mold begins within the crease the cracks splay forth subtlety. This space is not fictitious. I will continue to believe. Lifted up by the boards that my father had in his shed. For 9 years I have performed a show somewhere in the world on May 9th, the memorial of my mother, Cynthia Ann Africano. This year I feel honored to present be.leave in Bloomington, IL at The Jan Brandt Gallery. Along with an intimate performance I will be showing a select group of watercolors inspired by lyrics and imagery from my music. Accompanying me will be Elizabeth Holt Schwab and Tim Kramp, singing and playing percussion. --The images and songs included in the performance concern themselves with ideas of self, faith and movement. Standing still, still standing; dreams and hope and the different punctuations of each day, each life. I dedicate the evening to Cynthia and to all of my family and friends whose love and support have been the strength and force beneath the foundation of my own forms of faith. My dream is to make this into an annual event which will include more artists and musicians. This is will be a show of 8"x10" art works all created within the theme "Cats & Dogs." This is an open call, all age show! In my new exhibition, Next Stop: New Works on Paper, the focus continues to be on developing a language that combines graffiti, painting and the history of abstraction. I have adopted an overlooked, vague mark originating from the Chicago Metra train system and developed it into a personal tag. It functions as an internal language used as a means of finding and identifying an acceptable space to reside, an exploration found in both graffiti and painting. The process of working with paper directly references many of the subjects that originally generate the work. I immediately think of the different types of ‘temporary’ graffiti that I experienced in Detroit, such as marker on brown paper inspirational messages stapled onto abandoned buildings or spray painted drawings on found linen hung from broken windows. My process requires stretching the paper directly on the wall which creates a struggle to find balance between the delicate, volatile surface and the tension of it’s fibers to force it to flatten. When thinking about this material, it can be seen as a weak or fragile structure, but it’s strength becomes evident when being forced to a fixed position, often breaking free of the staples that attempt to confine it. The most current body of work, titled Leaf Forms, started as a mode that I often explored in my paintings-the landscape. For my works, the traditional landscape, i.e. mountains, trees, and foliage were the best way to link my figurative paintings. The landscape gave the figures a setting in which to interact, rather than be confined to a magazine or photo in which they were appropriated from. After living with these paintings in the studio I began to explore the shaped canvas, and started making what are now my Leaf Form paintings. The leaf shaped canvases no long serve as an indicator of landscape, nor are they linking together figurative works, but rather they serve to be an allegory about how life keeps persisting over time. “The Frontiers Series” are investigations of man's interaction with the unexplored sublime, a landscape that is boundless yet terrifying. They are not specific in their description of place or time, however they depict our interaction with an otherworldly landscape, one that is influenced by prophetic cinema, science fiction and survivalist grit. I seek to investigate the sense of awe coupled with immense anxiety about the unknown, not through a fear of dying but through a fear of surviving. The subplots of an otherwise master narrative consider the everyday; what would we harvest?, where would we live?, what would our ruins look like? It is through manipulating the images digitally, through data bending and digital collage that I fracture the images, as a way to create a type of picture puzzle of limited information one might receive from a very distant location. It is through painting them that I meditate on my own struggles with global conflict, strained economies, environmental uncertainty and political strife. Can we ever be truly confident with something we’ve created? The work in this exhibition is about the process of creation. Not to be mistaken for work that is strictly process based, the work presented here dictates the thoughts and emotions that arise from the artistic process – from the making of the work to the exhibition. Uncertainty, ambiguity, doubt, and anxiety exist. Brittney Hudgins’ work attempts to deconstruct and simplify common places and architectural structures in order to better understand them. She is interested in the intimate interactions one can have with a place without physically interacting with or experiencing it. Her paintings are reflections on routine, repetition and the human experiences that are created out of passiveness. Brittney Hudgins grew up in Williamsville, a small town just outside of Springfield, Illinois. She received her Associate of Arts Degree at Lincoln Land Community College in Springfield before pursuing her Bachelor of Fine Arts Degree at Illinois State University in Bloomington-Normal. Brittney completed her B.F.A. in Painting with a minor in Art History at Illinois State in 2010. Since graduating, she has been living, working and making art in Chicago. Brittney is currently working as an Associate Art Director for Prairie Fire Communications in a suburb of Chicago. Alex Carlson’s work explores a very particular yet entirely illusive space that each of us carries throughout our lives: the mind. The foundation of the work resides in his drawing practice, which is used to decompress the mental chatter and distracting patterns of thought one is inundated with on a daily basis. These disruptions take shape in the form of intuitive geometric clusters and constructions that are further ruminated upon in more refined studio works. At a glance the works may appear as planned designs, but over time reveal a kind of psychological energy present in the material and its handling. The works urge the viewer to unravel the fractured spaces of the mind while contemplating their own mental architecture. Alex Carlson was born, lives, and works in Chicago. He received his BFA in Painting from Illinois State University in 2011. He has shown with Brittney Hudgins at The Boiler Room in Chicago earlier this year and is proud to present these new works in his series at Jan Brandt Gallery.